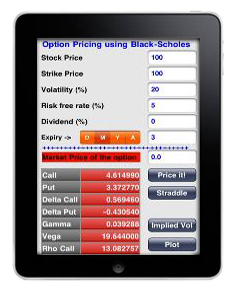 The Options Pricing Calculator computes Calls, Puts and the various Greeks using the Black-Scholes model. In the Pricing View, given the various options parameters such as Stock Price, Strike Price, etc., it computes the Call, Put, Delta Call, Delta Put, Gamma, Vega and Rho Call. 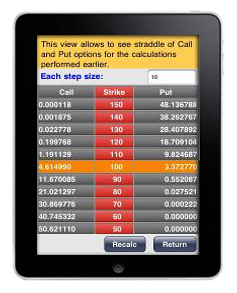 The Straddle View shows the various Calls and Puts for various Strike Prices. The Strike Price step can be changed to display a finer or broader range of Strike Prices. 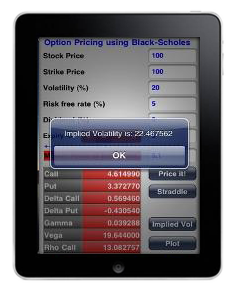 The Implied Volatility of an option for a given expiry date can be computed by entering the market price and then clicking on the "Implied Volatility" button. 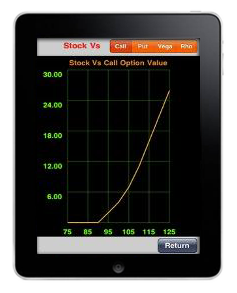 Various graphs of Stock Price versus Call, Put, Vega, Rho can be displayed as well.